Ferrell Jenkins & I are at the TLV airport, awaiting flights (different airlines) to Florida and Sweet Home Alabama respectively. It has been a great trip. 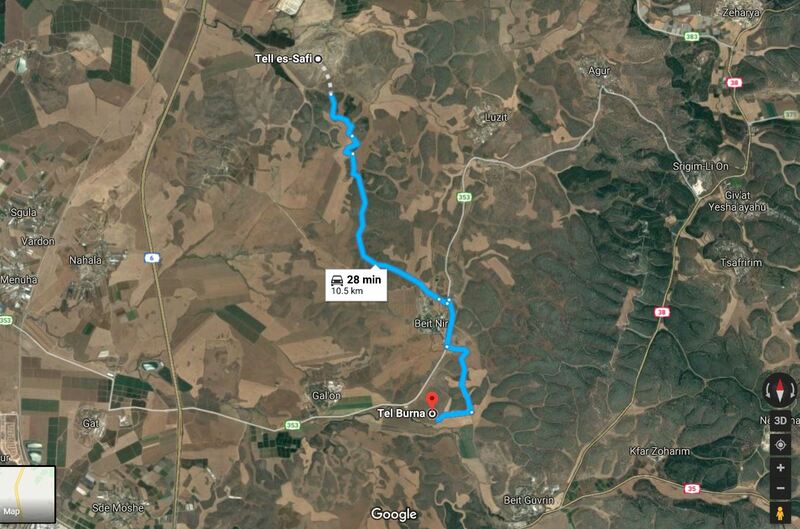 In Israel we’ve traveled and photographed from “Dan to Beersheba”, and on down to Elath. Our time was rather equally divided between Jordan and Israel. We’ve seen the Mediterranean, the Jordan (and some of its tributaries: the Banias, a sliver of the Dan, the Senir), the Dead Sea and the Red Sea. On the Jordan side we were able to see the Arnon and the Jabbok (where Jacob wrestled with the Angel). There is such variety in the land: a bit of snow could be seen on Mt. 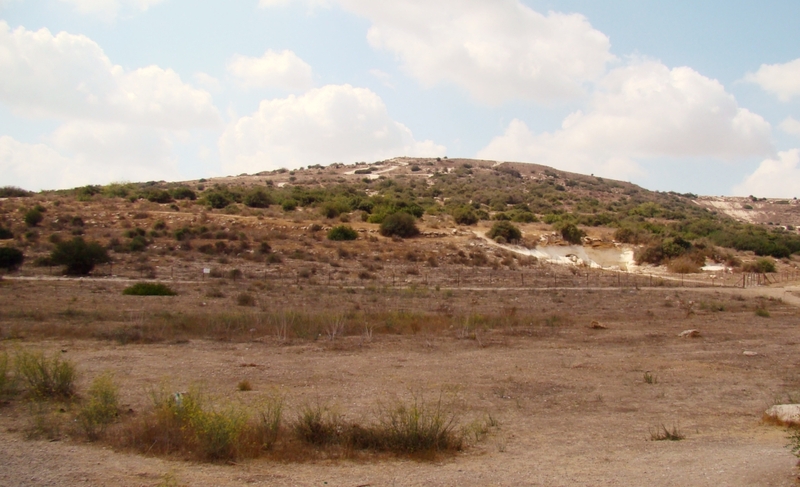 Hermon, the highest point of elevation in Israel. At the Dead Sea we were at the lowest point on earth. 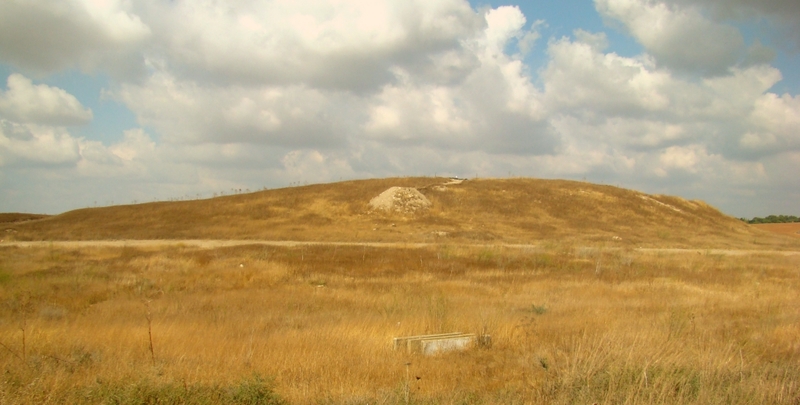 We traversed longitudinal zones: the coastal plain, the gently rising hills of the Shephelah, the hill country of Judea, Samaria and Galilee; the Jordan Valley, and the Trans-Jordan Plateau. We saw numerous green fields, some with crops, much agriculture, but also the barren desert. I learned a lot on this trip, enjoyed the companionship of a valued professor, esteemed friend, and fellow-worker. I took a few thousand photos which hopefully find use in various venues of teaching, preaching, classes and writing, as well as resources for our local congregation. The Siq at Petra. Photo by Leon Mauldin. The 1.2km siq, or canyon, with its narrow, vertical walls, is undeniably one of the highlights of Petra. The walk through this magical corridor, as it snakes its way towards the hidden city, is one full of anticipation for the wonders ahead – a point not wasted on the Nabataeans who made the passage into a sacred way, punctuated with sites of spiritual significance. The Siq starts at an obvious bridge, beside a modern dam. The dam was built in 1963, on top of a Nabataean dam dated AD 50, to stop floodwater from Wadi Musa flowing through the Siq. 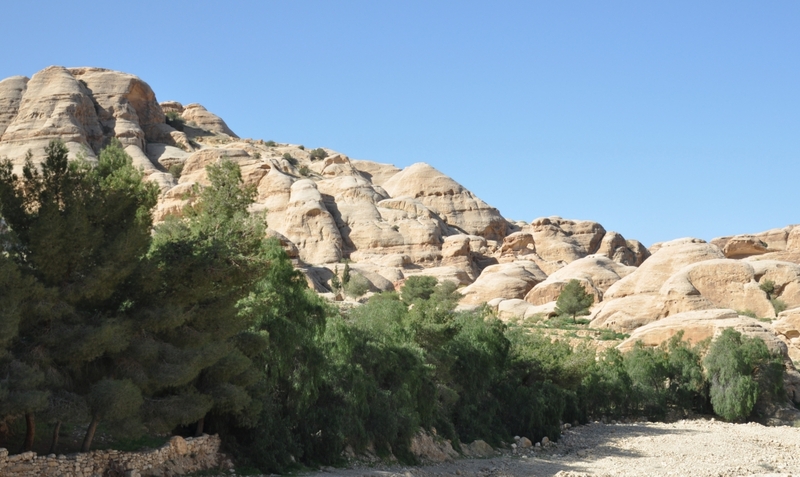 To the right, Wadi Muthlim heads through a Nabataean tunnel – the start (or finish) of an exciting hike. The entrance to the Siq was once marked by a Nabataean monumental arch. It survived until the end of the 19th century, and some remains can be seen at twin niches on either side of the entrance. Many people charge through the Siq impatient to get to Petra. That’s a pity because the corridor of stone is worth enjoying for its own sake and the longer you take to travel through it, the more you can savour the final moment of arrival. Technically, the Siq, with its 200m-high walls, is not a canyon (a gorge carved out by water), but a single block that has been rent apart by tectonic forces. At various points you can see where the grain of the rock on one side matches the other – it’s easiest to spot when the Siq narrows to 2m wide. The original channels cut into the walls to bring water into Petra are visible, and in some places the 2000-year-old terracotta pipes are still in place. A section of Roman paving was revealed after excavations in 1997 removed 2m of soil accumulation. Some historians speculate that the primary function of the Siq was akin to the ancient Graeco-Roman Sacred Way. Some of the most important rituals of Petra’s spiritual life began as a procession through the narrow canyon, and it also represented the end point for Nabataean pilgrims. Many of the wall niches that are still visible today along the Siq’s walls were designed to hold figures or representations (called baetyls) of the main Nabataean god, Dushara. These small sacred sites served as touchstones of the sacred for pilgrims and priests, offering them a link to the more ornate temples, tombs and sanctuaries in the city’s heart, reminding them that they were leaving the outside world, and on the threshold of what was for many a holy city. At one point the Siq opens out to reveal a square tomb next to a lone fig tree. A little further on, look for a weathered carving of a camel and caravan man on the left wall. The water channel passes behind the carving. Hereafter, the walls almost appear to meet overhead, shutting out the sound and light and helping to build the anticipation of a first glimpse of the Treasury. It’s a sublime introduction to the ancient city. (Lonely Planet Jordan: Travel Guide). “Treasury” at Petra. Photo by Leon Mauldin. 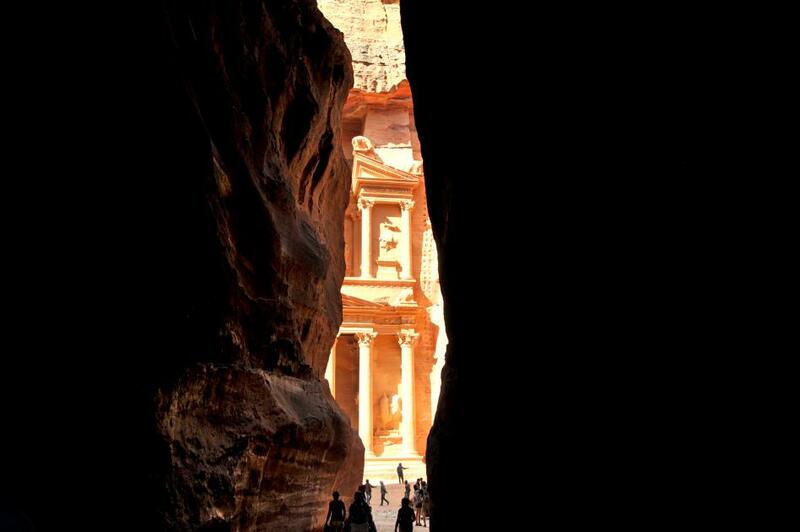 Known locally as the Treasury, this tomb is where most visitors fall in love with Petra. The Hellenistic facade is an astonishing piece of craftsmanship. 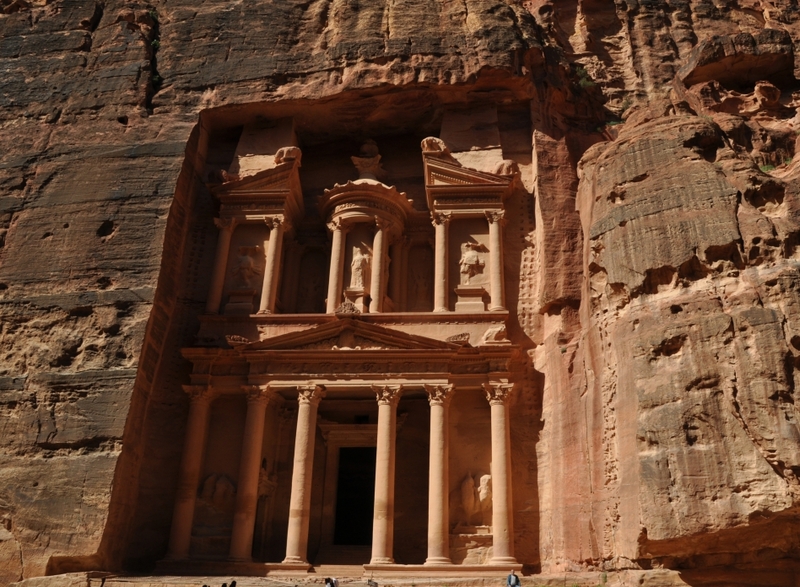 Although carved out of iron-laden sandstone to serve as a tomb for the Nabataean King Aretas III (c 100 BC– AD 200), the Treasury derives its name from the story that an Egyptian pharaoh hid his treasure here (in the facade urn) while pursuing the Israelites. Some locals clearly believed the tale because the 3.5m-high urn is pockmarked by rifle shots. As with all rock-hewn monuments in Petra, the interior is unadorned. (Lonely Planet). It’s been a while since I’ve been on horseback, and I had never ridden a donkey, but I did both today. 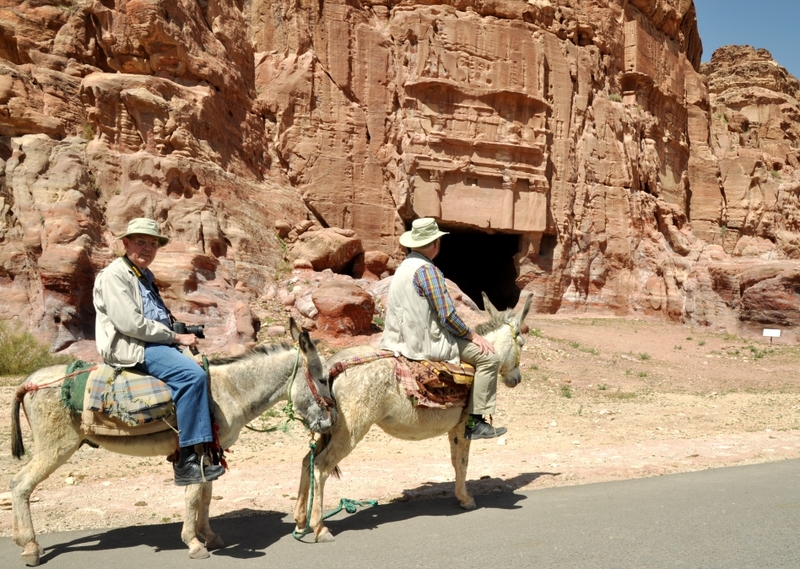 Ferrell Jenkins and Leon Mauldin riding donkeys at Petra. Photo by local Bedouin. Tonight we’re on the eastern shore of the Dead Sea as we continue to explore and photograph Jordan.